There are certain floral spectacles through the gardening year at Denver Botanic Gardens that are not to be missed: when the foxtail lilies (Eremurus) are all in bloom early in June, for instance, or the Iris beds much of May and June... Well, right now we have the time of Yucca blossoming--and they are truly amazing any time of day--although they seem to glow with a special luminosity in the late afternoon. Yucca rostrata may be primarily Mexican in distribution, but there are many robust and happy specimens blooming right now throughout the Gardens. I believe this my favorite! Same yuccas taken today, July 2, 2013! Do look back at the previous picture and see how dramatically these have grown in the last decade: I never cease to be amazed that Chihuahuan desert plants growing over 1000 kilometers south of here at lower elevations have the genetic tolerance to our severe winters! These have shown less frost damage than some of our native plants over that time! These were donated to us by Mountain States Nursery for testing and display, and I recall as Dan Johnson placed these thinking they would be the most expensive annuals we ever planted! 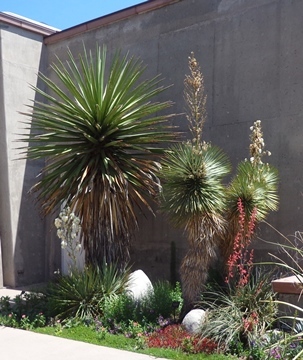 I was wrong, obviously....By the way, the largest yucca in this planting is Yucca faxoniana, and the more slender ones are Yucca thompsoniana--both from the Chihuahuan desert in Texas and Mexico with roughly the same range as Yucca rostrata. 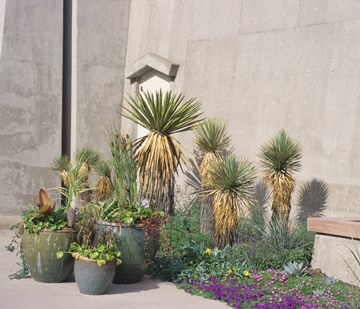 Denver Botanic Gardens has a remarkable collection of many dozens of accessions of cold hardy yuccas that are located in many of our gardens. Now is a wonderful time to look at these--I have discussed a few of them in yet another one of my blogs you can find by clicking here. And another one here! As you might have guessed, I like yuccas! 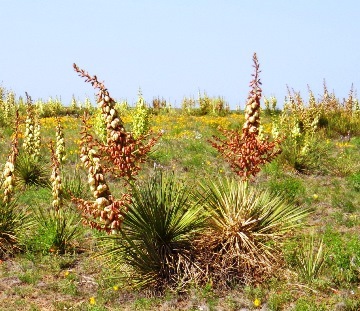 I end my little disquisition with a tribute to our ubiquitous, overlooked and sometimes maligned Yucca glauca: Last May I drove through vast forests of this species in the Oklahoma panhandle and was dazzled by their heavy blossoming. Among the mostly creamy or ivory flower stalks were many that were stained quite deep pink. 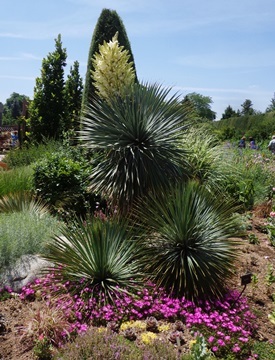 It was a dream of Claude Barr's to find a truly red yucca: I think these are well along the way to that goal! Alas, I was unable to collect that trip--so perhaps you can be the one to locate and introduce that holy grail?